Sinn Fein revealed some of the details of the deal they had made with the DUP before the collapse of the talks this week. Below is Mary Lou McDonald and Michelle O'Neill's full statement to the media. 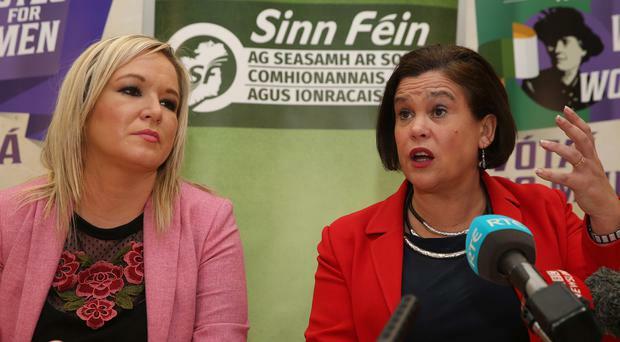 President Mary Lou McDonald said: "The DUP leader brought this phase of negotiations to a close and said “there is no current prospect of these discussions leading to an Executive being formed”. "It is up to Arlene Foster to explain this given that the DUP and Sinn Féin leaderships had achieved an accommodation across the issues involved. "In fact we had a draft agreement by the end of last week. At that time we advised the DUP leadership that the deal should be closed before those opposed to it could unpick what we had achieved. "We made it clear that if there was a delay there was every chance that the package would unravel. "The DUP failed to close the deal and went on to collapse the talks process. "The first point I want to make is an obvious one; this phase of the negotiations is over. "Sinn Féin has worked diligently with the governments, the DUP and others to restore the political institutions. "We did so because the institutions of the Good Friday Agreement are in the best interests of all our people, our economy, our public services and building reconciliation. "However, these institutions must operate with respect, equality and integrity. "That was Sinn Féin’s approach and that remains our approach. "There has been a lot of speculation about what was in the draft agreement between us and the DUP. "There have been calls for it to be published. "Sinn Féin at this time will not be publishing the draft agreement. "This is in keeping with our obligations to ensure that any future phase of negotiations has the best chance to succeed. "However, this will not happen unless the unionist parties embrace the need for a rights-based society and for citizens here to enjoy all those rights available across these islands. "In keeping with our commitment to transparency we will provide copies of the draft agreement text to the two governments and we will brief the other parties in the Assembly and the Oireachtas. "For the record the draft record included an Irish Language Act, an Ulster Scots Act and a Respecting Language and Diversity Act. "The Irish Language Act included provision for official recognition of Irish, the creation of an Irish Language Commissioner. The repeal of the ban on Irish in the courts was also to be legislated for. "It did not involve at any stage making Irish compulsory or applying quotas to public services. This was not a consideration. "There has been no meeting of minds on Marriage Equality. "We anticipate that this issue will be fully considered by the Assembly in the form of a Private Member’s Bill and it is acknowledged that no party alone can table a Petition of Concern. "There was also agreement to review the abuse of the Petition of Concern and establishing a committee to look at the Bill of Rights. "Separate from the agreement between the DUP and Sinn Féin we had a commitment from the British government to put to consultation the legacy mechanisms agreed at Stormont House and release the funding requested by the Lord Chief Justice for coroner’s courts. Sinn Féin accepted the DUP proposals on sustainability of the institutions. Sinn Fein Vice President Michelle O’Neill added: “If the DUP leadership had closed the deal last week the Executive would be on the cusp of being re-established to implement the agreement, set a budget and work to deliver for all. "Given that the DUP leadership has now prevented this the two governments must now move ahead to implement existing agreements on legacy and an Irish Language Act and meet their obligations for equality, by bringing forward legislation on marriage equality. "We will be speaking with the British Prime Minister later today and with the Taoiseach. "We are calling upon them to establish the British Irish inter-governmental conference as soon as possible. "We are also very conscious that the Tory government supported by the DUP are set on taking this part of Ireland out of the European Union despite the vote of the people of the north to remain and regardless of the damage this will do to the people of the island of Ireland.